The writing on the back ( in my mother's distinctive hand) says the year was 1968. I remember wearing that dress, it had a little white bonnet that went with it, and gloves, and a little handbag ( though I don't know what I would have carried in it, probably kleenex). I was so proud of my pink satin dress. My Nana made that dress for me, my father's mother. She made my sisters' dresses, and dresses for my two cousins as well, and probably the suits the boys wore. Nana was a seamtress by trade, an artist with fabric and ribbon. That year there were 7 children at the hunt. My older sister from my Father's first marriage, my 3 older cousins and their brother, who was a baby like my little sister. My brother wouldn't be born for 2 more years, and by his first Easter Daddy would already be gone. The yard was huge, and full of wonderful plants and trees, great for hiding and hunting eggs, and the special baskets left by the "Bunny". There was laughter and singing, and a big family dinner. I miss Easter. I miss my Mom and Dad, and my Grandparents, my sister Loree. I miss dressing up and posing for pictures in smart spring clothes, and eating dinner all together around the table. I don't remember the last time it felt like Easter to me. Oh I try, but this weekend was just so sad. It snowed all day yesterday, it was pretty, but it didn't help me feel the spring. Today it is cold and dark and wet. I colored eggs, all by myself, hoping that Kate would change her mind and join me. She wasn't into it this year, so I did them myself. I watched the Sound of Music last night, I'd never really seen it, and wanted to share it, make it a family time, but my kid just complained through the whole thing, while Steve listened to UFO cd's on his laptop. Happy times. I put together the clues for a treasure hunt, something Steve's stepmom started for the kids and we continue when we aren't with them . It's clues that eventually lead to the hidden Easter Basket. I got up early and put together a basket of treats for a friend's daughter. They have been having money troubles, and she just started a new job last week, I knew she wasn't getting paid in time to do anything for Easter. I snuck over there early and left a basket from the "Bunny" on their porch. I made breakfast, that everyone ate separately, Steve silently, Kate complaining about the pancakes. So I put a ham in the oven, and my husband left to " go get cigs". Two hours later he called , he was hanging out with friends ( drinking, I suppose) and wanted to know if my brother had come over. What difference does it make if my brother is here? I'm here, Kate's here. The nice dinner I made is here. Seems he claims he went over there to see if they got the basket I'd left for their daughter. The one I made in secret and delivered annyomously. The one I told him I wanted to sneak onto their porch before anyone woke up. Nice, wreck the one good thing I did that turned out right today. My Katie keeps coming over to give me hugs and jellybeans, she feels bad that I can't stop crying, but I'm tired of pretending that everything is alright, because it's not. 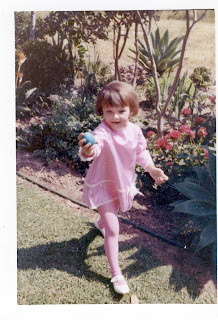 I miss family holidays, and my Mom, and my little pink satin dress with the shiney white shoes. It just doesn't feel like Easter to me. I love you, honey. We must talk again soon. I wish I could make today good for you. Sweetie, don't place too many expectations on a holiday. It never turns out just right. And, I totally understand the whole it didn't feel like Easter thing. It started snowing during our Egg Hunt on Saturday at the church. WTF!?! We live here. Not in freaking Michigan! Totally killed the springtime mood I had going. I didn't even cook a ham this weekend. I did, however, make a roast. Confused Easter? Most definitely. Just remember something, dear...no matter what, it's about family and time together - no matter how much of the family is present. I think your Kate has started to grow up a bit. I don't know about your hubby. It's been too long. I've missed you! I'm sorry your Easter was so tough. Many hugs to you. *hugs* for the bug. I miss my mom too. And I miss the holidays of my youth, the ones that were by no means perfect to an outsider, but were perfect for me.